Course on Type 1 diabetes has a twist: The students are living with the disease. Carol Atkinson, director of the nonprofit Insulin for Life USA, addresses a class whose students are mostly those with Type 1 diabetes. The sound of beeping during a typical University of Florida lecture might draw a few quizzical glances, some people perhaps wondering why anyone would still be using an outdated pager. When the beeping interrupts a certain directed research class, however, seven heads look down in unison. All seven have Type 1 diabetes and they know it is the sound of an insulin pump. But whose? Sometimes a class is just a class. This one is a class and a community. As part of an effort to make UF a destination and inviting home for students with Type 1 diabetes, the UF Diabetes Institute offers a two-credit course each spring semester providing students with an introduction to groundbreaking research underway at the institute. It exposes students to professional pathways in diabetes research that might influence their career trajectories, class organizers say. Sometimes, students attend because they just want to know a little bit more about diabetes. In the end, it’s a course led by the leading minds in diabetes science and treatment for those people the class instructor calls the real experts: students living with the disease. A science background is not a prerequisite, nor, for that matter, is a Type 1 diabetes diagnosis. But the course is geared for students who have a “personal connection” to Type 1 diabetes, an autoimmune disease in which the pancreas stops producing insulin. The disease affects up to 1 in 300 children or young adults, and it can occur at any age, though it is most often diagnosed in those under age 20. Seven of eight students in the fall class have Type 1 diabetes. The one who doesn’t has a family member with the disease. The class, he said, provides a “safe place” for students. Meeting weekly at the Biomedical Sciences Building, students hear from speakers who run the gamut of UF’s work on diabetes, from Desmond Schatz, M.D., a past president of the American Diabetes Association and medical director of the UF Diabetes Institute, to Allison O’Kell, D.V.M., an assistant professor in the UF College of Veterinary Medicine who has done research on diabetes in dogs. Though most students have lived with diabetes their entire lives, the course is nonetheless often their first deep dive into the science of a disease that stubbornly resists a cure. Mollie Huber, who took the class as a senior microbiology major in 2018 and is now in the biomedical sciences Ph.D. program, has been living with Type 1 diabetes since age 5. Her brother, Sam Huber, now a sophomore, also has the disease and took the class with his sister. Mollie Huber credits the class with solidifying her desire to make a career in diabetes research and one day examine the genetic underpinnings of the disease. 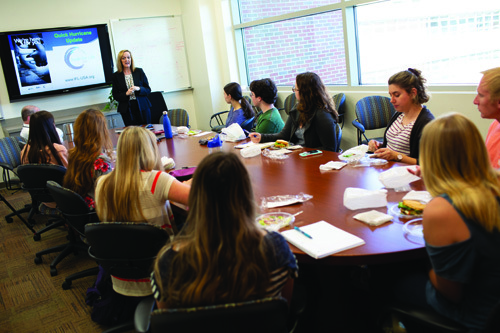 Numerous students who have taken the two classes offered so far have decided on careers in diabetes, said Walker, who is a faculty member in the UF College of Public Health and Health Professions’ department of health services research, management and policy. She also is the director of health equity initiatives at the UF Diabetes Institute. Class sessions can offer a freewheeling dialogue not just on the latest research in diabetes, but also on the challenges of living with the disease. Professors and students learn from each other. Mark Atkinson, Ph.D., director of the UF Diabetes Institute and a leading researcher in the field, and his wife, Carol Atkinson, director of the nonprofit Insulin for Life USA, addressed one class last spring. Mark Atkinson asked students about how UF could be more accommodating for those with diabetes and about their own experiences on campus. Mollie Huber mentioned that a nurse once told her that she would never lead a normal life because of her Type 1 diabetes. Atkinson frowned. “You’re kidding,’’ he said. “Back when I was born, they used to tell people, ‘Ah, you have Type 1 diabetes.’ They used to tell parents, ‘Your child is not going to live a normal life. They can’t be airline pilots. They can’t be doctors. They’re going to live a shorter life. They’re going to be blind. They can’t have children.’ All of this stuff that maybe two generations ago had some substance. Schatz, the UF Diabetes Institute medical director, told students not to refer to themselves as diabetics. They are people with diabetes, he said, urging that they not label themselves.